Toro’s Groundsmaster 360 riding mower combines the agility of a zero-turn riding mower with the flexibility of an out-front rotary mower. Toro’s Groundsmaster 360 riding mower combines the agility of a zero-turn riding mower with the flexibility of an out-front rotary mower. 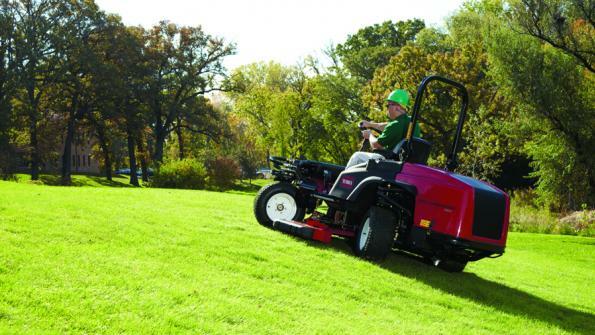 The mower offers hillside traction and stability to go places (subject to slope limitations) inaccessible to most other large-area riding mowers, according to the manufacturer. The model relies on Quad Steer all-wheel steering with the added control of a steering wheel. The machine’s Quad-Steer technology minimizes turf damage due to its steering geometry. A 100-inch cutting deck is available on Toro Groundsmaster 360 mower models. The model launched in 2010. The unit is designed with large-area mowing in mind. The model provides a versatile solution for both wide-area mowing and trimming in one machine. The three-section deck incorporates two side wing decks that articulate up and down, up to 15 degrees. The mower follow contours of the terrain, making quick work of any mowing job. The wing decks raise for transport, allowing the mower to fit easily onto trailers. The center deck is 51 inches wide with each wing deck 25 inches wide. Go here to learn more about the company’s rotary mowers. In the video, see the performance of the Toro 360 Quad-Steer model with 100-inch deck option.